We have been developing websites for many years and specialise in e-commerce sites which are powerful, simple to navigate, full-featured and easy to buy from. Many companies over the years have benefited from our vast experience in this market and are now running web sites turning over millions of pounds. 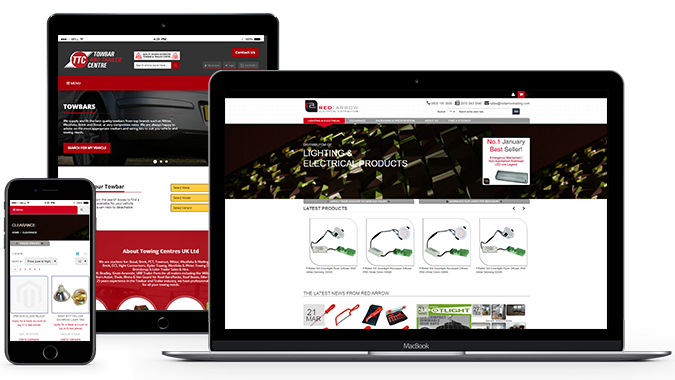 We believe that maintaining your web site should also be easy so we have created a product called Webshop. Webshop acts as the intermediary between your website and the Sage accounting system. It uploads product content and pricing from the accounts system to your website to keep it up to date. It also downloads orders from your website into your accounting system requiring no addition re-entering. Our platform can integrate with most business systems, to ensure your sales process can fit seamlessly into your website. We have particular expertise with Sage to sync stock, invoicing, customers and credit accounts. A web platform bespoke to you, which suits the way your customers want to buy. Featuring a simple and intuitive user interface, it will enable you to fully-automate your processes, including inventory control, shopping carts, order confirmation, invoicing and accounting. Get instant insight into the performance of your website and sales campaigns with up-to-the-minute reporting, data and analytics about key aspects such as visitor statistics, sources of traffic, sales volumes and conversion rates. Ensure your website ranks highly in search, with all the tools required to make your website SEO-friendly and to optimise new content added to your site, so it features highly in all search engine results, not just Google. Gain complete end-to-end control of your sales flow with integrated inventory and stock control, order managementand dispatches. Shopping carts, order confirmation, invoicing and accounting make keeping on top of your sales process easy. Fully automate your stock, ordering and delivery processes to ensure you hit deadlines and deliver exceptional customer service. Maximise localised search engine rankings in your target countries with multilingual ecommerce solutions, which can be scaled as you expand geographically.